Who: Brandon Morrow, No. 23. Right-handed starting pitcher. 6’3”, 195 LBS. 27 years old. Contract Status: Signed three-year, $21 million extension to avoid arbitration this past January. 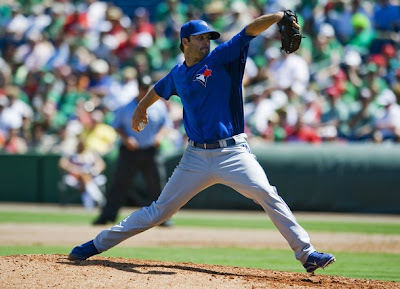 Career Stats: 4.37 ERA and 1.38 WHIP in 187 games (71 starts) over five seasons with the Mariners and the Jays. In 523.1 innings pitches, has struck out 585 batters (10.1 K/ 9), walked 263 (4.5 BB/9). 2011 Stats: 4.72 ERA, 1.29 WHIP, 203 strikeouts and 69 walks in 179.1 innings over 30 starts. Nerd Alert: Morrow posted a 3.53 xFIP (25th in MLB) and 3.31 SIERA (14th). Which, in case you’re not predisposed to such ways of measuring things, is pretty good. Looking Back: Morrow’s 2011 never seemed to fully get on track, especially given the astronomical hopes that had sprung up after his otherworldly 17 strikeout, one-hit masterpiece at the end of the 2010 season. The Jays brass has been cautious with Morrow – maybe even to a fault – and didn’t allow him to make his first start of the season until April 23rd. Moreover, they were quick to pull him out of games early in the season, at times not allowing him to pitch his way out of his own trouble. Both decisions irked Morrow, who seemingly wants the team to take the training wheels off and let him go. Though the ERA wasn’t anything to write home about, Morrow managed to impress in two rate stats of note: His strikeouts per nine was the best in the American League at 10.2, and he dropped his walks per nine to 3.5, the lowest mark of his career. His 1.29 WHIP was also the lowest of any year in which he served primarily as a starter. As the nerd stats seem to indicate, Morrow was also extraordinarily unlucky, especially when it came getting double play balls. He was on target to go the entire season without the benefit of a GIDP until his second-to-last start, in which he elicited one from the Tampa Bay Rays in a 5-1 victory. One pitch that doesn’t show up in Fangraphs’ pitch type breakdown is a cutter, which Morrow affirmed on Twitter that he was working in to his repertoire towards the season’s end. It will be worth watching to see if he continues to mix it in this year. Looking Forward: So Brandon Morrow puts up basically the same ERA as Brett Cecil last year, and somehow, we’re figuring that he’s a staff ace who’s almost ready to assume the mantle. Funny how that works. The separator is that Morrow has the ability to miss bats, and to overpower hitters when the need arises. He was somewhat susceptible to the long ball, which is a problem for a pitcher in the AL East, but his stated recognition of a need to pitch to contact earlier in games might help to minimize some of the damage that comes with those big flies. Morrow enters the season as the number two starter, and we certainly feel as though he could be the best pitcher on the staff on any given day. But even being that high up the pecking order, Morrow should feel the push from the young pitchers coming up quickly in the next year or two. When you look at the SIERA rankings, you see Morrow’s name alongside James Shields, Matt Garza and Dan Haren, that exactly the class of pitch with which we think he belongs. 2012 Expectations: Maybe we said this last year as well, but this year, we really mean and really think it will come to pass: Brandon Morrow is going to come into his own this year. With a little luck and some good defense behind him, an ERA in the mid-to-low 3.00’s doesn’t seem out of the question. I think he racks up around 235 Ks as well. He might be one of the most fun pitchers to actually watch pitch on TV. The action on the ball coming out of his hand is videogame-ish. Morrow and Romero are pretty much mirror opposites, stats wise, yet of pretty much equal overall quality. Romero is near top of the charts in ground balls; Morrow is near bottom. Romero is near the top in strand rate, OPS with runners on; Morrow is near the bottom. They make a pretty neat nerd stats side-by-side comparison. 235 SO would mean around 200-215 IP for Morrow, which could happen if he avoids injury, and if the Jays staff actually let him add the customary 20-30% innings to his workload. This could make for a very fun story in 2012. I believe Morrow will have a great year, but remember, he'll get hit at some point. Jays brass have alluded to him being more of a pitcher this Spring than a power thrower, which is exactly what pitching nerds like myself needed to hear. Keep in mind he still has that power pitcher core, though, and when the secondary stuff doesn't show up - you can get hit real hard. Expect a great season, but expect some gross outings as well.